Your teammate sent you the final project report in PDF format but incidentally you found some mistakes in that and you would like to correct it before your professor reduces your score. This could be a last minute panic and a hectic task to find the source of the PDF, then edit, and create pdf again. In another scenario, you want to make an excel graph from the data that you found in an eBook, all you could do is either manually enter in the excel file or copy and paste and then rearrange all the columns and rows, it would be again a time consuming process especially if the data table is two page long! In yet another scenario, you do not have AutoCAD, so your teammate sent you a PDF copy of the engineering design, but now you have AutoCAD and want to edit it, first you will need to find that friend so he can mail you the original copy of the design again. For all this, you can use online pdf converter tools. However, for two pages of data will you convert an entire 500 pages of the eBook? Moreover, there is no guarantee if the data will fall exactly under the respective rows and columns. There is a simple and more productive solution by Investintech with their product Able2Extract PRO. The software uses advanced custom conversion technology for accurate and seamless conversion of data in PDF into popular formats like Word, Excel, PowerPoint, AutoCAD, Images, Publisher, Open office, text and HTML. The software has brilliant user interface and is extremely easy to use. All you have to do is open the PDF document, select the whole document for conversion or select a specific area/part of the document and then choose the desired format, choose the destination and you are done. First cross platform PDF converter: Able2Extract is the first cross platform PDF converter, which will work without any problem on your Windows, Mac, or Linux powered computers. In addition, Able2Extract also has free apps for Android and iOS operating system. Convert multiple PDFs at once: Able2Extract comes with the feature of batch conversion that can save your time by converting multiple PDFs into desired format all at once. 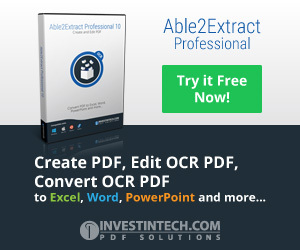 Extract and convert data for editing in Microsoft Office: With Able2Extract, conversions can be customized by users at a granular level allowing them to extract a part or an area from the PDF into desirable format for editing that includes DOC, PPT, XLS, HTML, TXT, AutoCAD, MS Publisher, Open Office and many more. Convert PDFs into ready to publish HTML: You have an official document like circular or notice or user agreement and you want to publish on your organization’s website. In that case, you do not have to go into the coding and designing. Able2Extract can convert that document into ready to publish HTML within seconds. All you have to do is upload! Extract AutoCAD designs from PDF: You had no AutoCAD in your system but you wanted to review that final design. They send you the design in PDF. Now you have AutoCAD and want to edit that minute detail. You run after them to mail again and waste your time. Able2Extract can extract that design from the PDF so you can edit in AutoCAD. How comfortable it is for us engineers! Last night preparation for exams: It is exam time and you are known as a guy who never makes notes in the class. A day before exam you catch that first bencher who has his all notes complete. You take pictures with your camera or scan it in your room. However, you prefer using your own words and make your last minute flash notes. Able2Extract Professional 8 OCR technology can help you achieve this. It can convert even scanned documents to any format you want! Open a PDF, I opened my old train ticket just for an example It has a nice table. Bingo! You have it in Excel. Just for a change, I have a return air ticket here. It has graphics, colours, tables, lots of text. Would be a great example for our testing. It involves the same steps as above, just instead of pressing Excel button, you press Word button. And it will open in Microsoft Word all by itself! Everything came to MS word without any extra settings. And look Word even found mistakes in the sentence!! You are awesome Word! Note my signature did not come well, anyway I will print it again after correcting the mistake and sign. Able2Extract PRO is available as trial version for 7 days. If you need it for longer time, but don’t want to spend money for the full version then you can go for the 30 days subscription plan which costs only $34.95. Full version can be bought for $129.95 it is recommended for teachers/professors and those who often work in report making department. However, we recommend this product to all. This definitely increases our productivity and creativity. It is a tool that has the ability to change the way you work!